One way van hire Spain to UK is a great idea when a removals company is helping you. It will get your belongings to your final destination quickly and effectively, giving you the ultimate peace of mind. What should you check before you sign up with a removals firm? 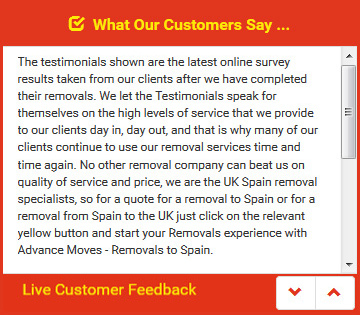 Once you have received your quote from the companies (more than one is a good way to ensure a fair price) you are thinking of using for removals to Spain, make sure that you read each one thoroughly. This is a busy time, and it can be tempting to simply scroll to the bottom of the quote for the price, but you might be missing out on something important. Is there a reason that one company is much cheaper than the other, for example? Perhaps they have not included something that the others have. Look carefully and compare the quote properly. Check also that the quote is firm, and that there aren�t any hidden costs that will be added onto it at the last minute by the removals company. Booking your own van hire Spain can seem tempting, but it is worth speaking to a professional removals company since their expertise and experience will save you money in the long run. When you do choose a removals company for your one way van hire to Spain from the UK, ask to see their insurance documents. This is essential as without the correct insurance you could be in serious financial trouble � not to mention stress � if something were to go wrong. Finding the perfect removals company in order to obtain one way van hire Spain to UK can be hard. Visit Advance Moves (http://www.advancemoves.com/) to end your search and relax in the knowledge that we are experienced and professional. Call us on 0871 218 0612 or email info@advancemoves.com to find out how we can help you.